Work, kids, pets & life! Not to mention, managing the household. How do you make it all work? As a working mother with 2 children, I have been able to create a perfect cleaning routine that keeps my home clean, and I can say, that I absolutely LOVE coming home to a warm welcoming, clean & clutter free home. The secret to a clean home is habits! Once you have mastered the 5 daily cleaning tasks, your home is already a step ahead and on semi-autopilot. 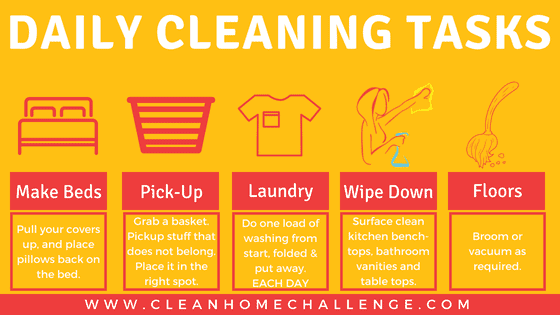 Once mastered, these 5 daily cleaning tasks, should not take longer than 30 minutes to 1 hour to complete. I have created what I complete in a 2-3 hour professional cleaning service for my clients, into a manageable, weekly cleaning routine for you. You have the option of completing ALL tasks on 1 day, taking 2-3 days to complete, or spreading it across the entire week. I leave Saturday & Sunday for my monthly cleaning tasks. I enjoy my weekends with family, so usually spend only a few hours on the weekends completing the monthly cleaning tasks. 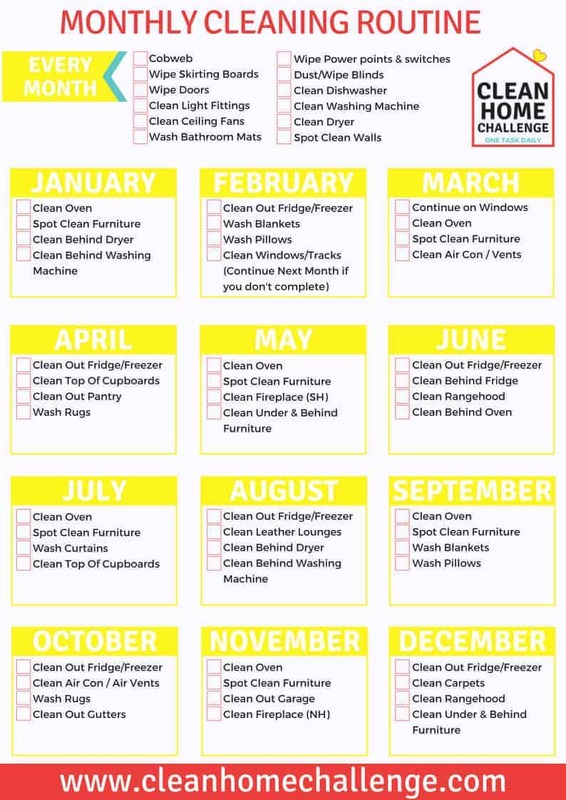 Follow my monthly cleaning routine for tasks that are either monthly, bi-monthly, quarterly or annually. 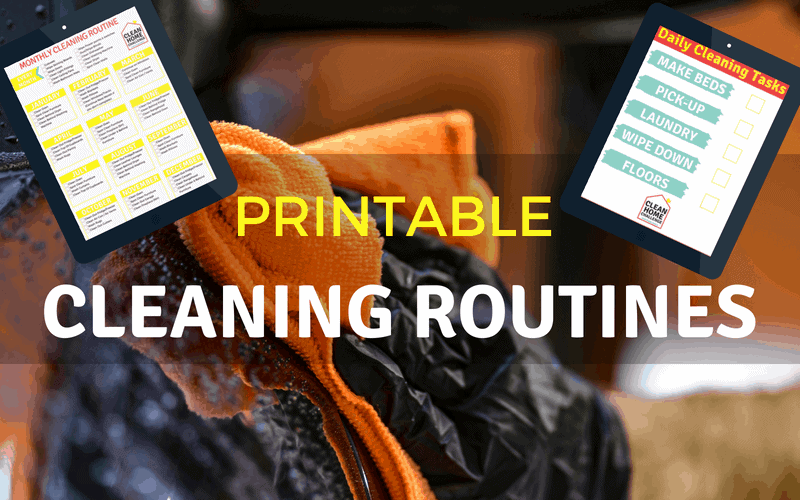 These tasks usually take more time then your daily & weekly cleaning tasks to complete. These cleaning tasks, are those that give your home a good deep clean, and a sense of satisfaction of being completed. There are 12 minor tasks, and 4 major monthly tasks to be completed. 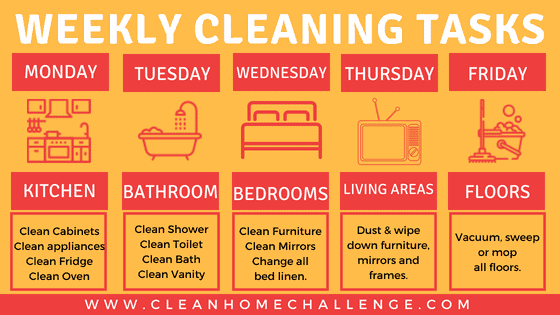 You can achieve this by doing 1 cleaning task for each weekend of the month.